Here is the challenge: how to construct a detailed prop with virtually no budget. Well, there are some strategies for accomplishing such a task. As I began working on the Death Ray weapon for the web series, “Normally This Weird” I quickly had a number of realizations. The most sobering was that this was not going to be as easy as I thought! Sometime you just have to do a project because it is too cool to pass up and you just know it will be fun. While I am semi retired (I am not retired yet!) from the visual effects biz, I still get the bug once in a while to do “just one more project.” My son, Nathan Stipes, has been the Art Director and de facto prop master on a web series called, “Normally This Weird.” http://www.normallythisweird.com/ It is a creative, web-based series of episodes written and directed by Phoenix film maker, Nathan Blackwell. The series covers the strange adventures of a normal young couple who move into a neighborhood filled with some kinda’ unusual people. You have an eccentric inventor who is married to what may be an alien disguised as a 1950 ‘June Cleaver’ housewife. There is the ‘Men in Black’ style FBI agent and his men constantly trying to expose the strange goings-on. And more! Night of the Creeps on DVD finally. 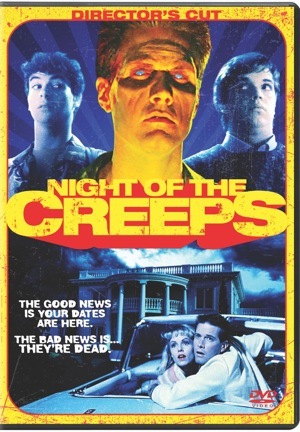 Finally, after years of waiting, “Night of the Creeps” has made it to DVD release. The 1986 horror / sci fi film, written and directed by Fred Dekker, has been a somewhat hidden away cult classic. My son, Nathan, and I found it at Wal-Mart for about $15.00. It has the cemetery ending Dekker originally planned for the film. Allen L on Night of the Creeps on DVD finally.